Some hazards of Sasquatching: evidence that isn't. As with any scientific endeavor, there are essentially two main categories of error that an investigator may encounter: False positives, and false negatives. Both are pretty simple concepts that are easy to understand, but they can both be sneaky. Most investigators, or even casual enthusiasts would probably agree that there are plenty of false negatives in Sasquatchery. What I mean by this is that, assuming sasquatches are in fact real animals, they have almost certainly been seen, and written off as trees, bears, rocks, or what have you. The same goes for tracks. There are many accounts of people who claim to have seen giant-sized human-like footprints in sand, snow, and dirt, and say they initially thought nothing of them until something else occurred that drew their attention to them (how someone can see such a track and not find it unusual is beyond me, but there you have it). Assuming these stories are not all fabricated, it would seem reasonable to assume that there have been occasions in which people have seen the tracks, thought little of them, and nothing else happened. They then just went about their lives, never giving them a second thought. Since these are essentially stories about nothing happening, we probably haven’t heard many such tales. These are examples of false negatives. False positives are also a big part of any investigation into the sasquatch. Logically, every incorrect report of a sasquatch encounter would be of this type. If sasquatches are not in fact real animals, then every single report, encounter, sighting and track would have to be a false positive. The fact that there have been hoaxes, mis-identifications, optical illusions, pareidolia, and just plain fabrications is beyond question. All of these things happen frequently, and they are all very important to keep in mind when out in the field. Now, I freely admit that I have spent precious little time in the field, but what time I have logged has proven to be very educational. My first actual, intentional bigfoot search occurred shortly after I graduated college. One of my housemates and I spent an afternoon and evening discussing the topic of sasquatches, and by the time evening was turning into night, we had gotten into his car, and were headed into the woods west of Portland, Oregon. We drove the paved roads way out of town until we reached a county line, where the road was no longer maintained. We then proceeded on dirt and gravel. Since the most common form of sasquatch encounter is a sighting along a road, we figured this was our best shot. It was, of course, a complete lark, and we had no real hope or expectation of seeing anything. An hour or so past the end of the pavement, and several hours into the darkness, the road curved around a hill to the left, and to the right the ground dropped away into a very picturesque little valley, which was nicely illuminated by a bright, nearly full moon. What I saw from the passenger seat of the car caused my stomach to drop. Standing there, not far from a couple of large Douglas Firs, was a large, shape, which appeared to be standing upright, with a rather pointy head. The head in particular reminded me of one of Ivan Marx’s photographs which had long ago been confirmed as a hoax. Feeling a surge of adrenaline, I pointed the figure out to my friend, and we both decided it would be a better idea to keep driving. Neither one of us could be sure just what it was we had seen, but we were both sufficiently startled and scared to just let it be, and not stop to investigate. We didn’t double back, and eventually found a road that connected back up with a state highway and headed home. I couldn’t get the experience out of my mind, and I wondered hard about whether or not I’d actually encountered a sasquatch. Of course, it was a tree. I haven’t been back by that way in a few years, but I suspect it’s probably still there to this day. What I learned from that trip was just how easy it is, especially if you’re out in the woods, spring loaded to see any little morsel of evidence, to find something that isn’t actually there. That tree was a false positive. Since then, as I have ventured out into the woods in search of signs of sasquatches, I have discovered just how many opportunities there are for this type of error. Enough, in fact, that I can honestly say that on every single trip I have taken, I have found something that sure looks at first glance like evidence of a sasquatch, but I have yet to spot anything that has held up under closer scrutiny. Taken along Bluff Creek road in the Six Rivers NF area. On my first trip to the Bluff Creek area, while driving along Bluff Creek road just off of highway 96 in Northern California, I saw this out the window of my pickup truck. At first, just like when I saw the tree in the valley nearly 20 years before, my heart skipped a beat, my breath caught, and my stomach dropped half an inch. Here is the same image, with the area in question circled. Could this be the head and shoulders of an upright primate, peering from the bushes to get a better look at my pretty red truck? The same image, zoomed. The head and shoulders are clearly visible. Well, here’s the thing. You could drive up Bluff Creek road right now and take this same photograph. 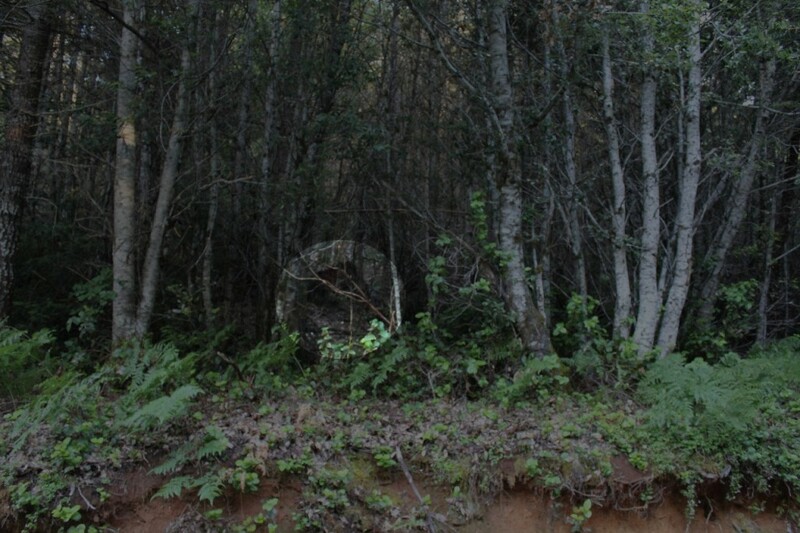 The shape in the image is in fact the root ball of a tree that fell away from the road. 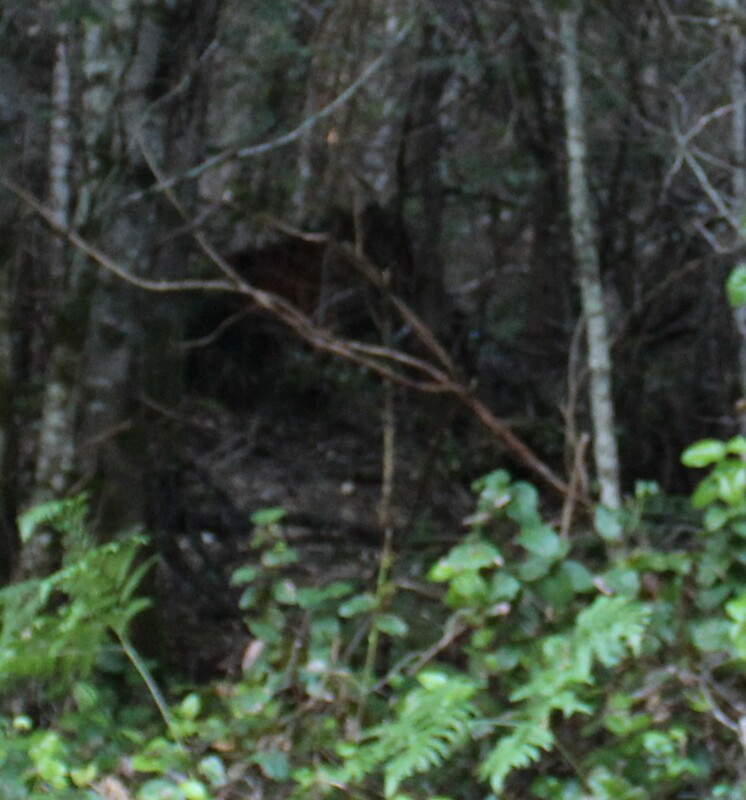 This is certainly a false positive, but since the subject is not moving, nor is it likely to move in the near future, someone claiming that this is a photograph of a sasquatch would probably have to be engaging in dishonesty. It’d hard to imagine this one being honestly, but mistakenly put forth as actual evidence. Is this a juvenile sasquatch exploring a concrete box? 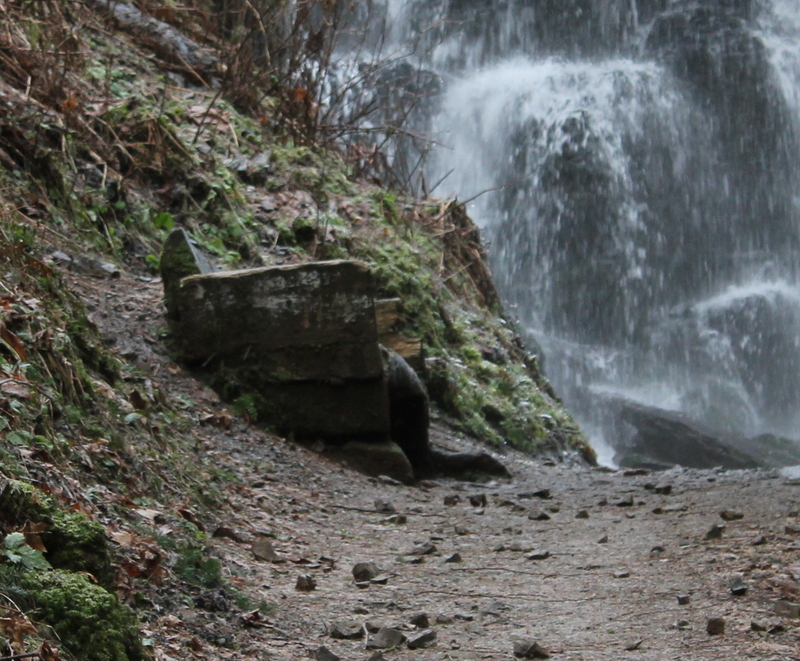 Not long ago, I was on one of my favorite day hikes in the Columbia Gorge. As I rounded a switchback, I again was slightly startled to see what initially looked like an animal rooting around in a concrete box, maybe a garbage bin? As I got closer, I first realized that there was no way this could be a small black bear. It looked a lot like the rump and leg of something built a lot like a human. Once again, the fact that the thing was utterly motionless was a pretty good clue. As I got closer, I saw that what initially looked like the lower half of an animal was in fact the decorative foot of the bench. Not so squatchy now, huh? This is the same concrete structure as in the previous image, but it looks a lot less animal-like. 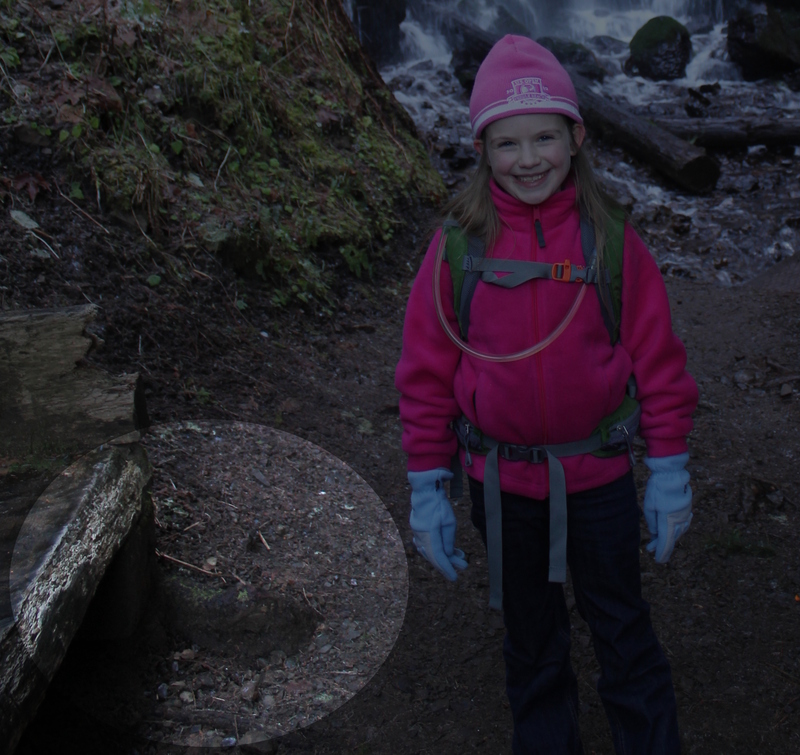 There is another foot on the near side, but the lighting and angle of the image keep it very well hidden. This is another image that can be easily duplicated. Just start at the Wahkeena falls trailhead, and hike up toward Fairy Falls, which is the name of the waterfall in the background. It’s a nice bench, and a great place to sit and have a short rest. Who knows, maybe a real sasquatch will wander by. Again, because of the static nature of this image, if it were presented as evidence of a sasquatch, it would have to be due to an intention to deceive, rather than an honest mistake. A sasquatch footprint in the snow? On the same hike where I encountered the previous image, I also came across this very interesting looking track. 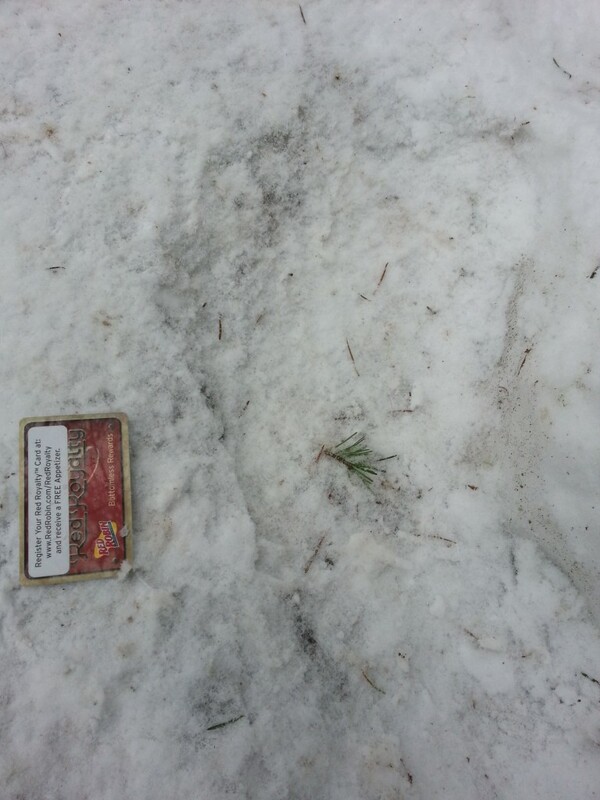 The only object I had handy for a good scale comparison was a restaurant rewards card that I had left in my coat pocket (I was not expecting to find any actual sasquatch evidence on this particular hike). As you can see, it is longer and wider than a normal human track, and somewhat oddly shaped. 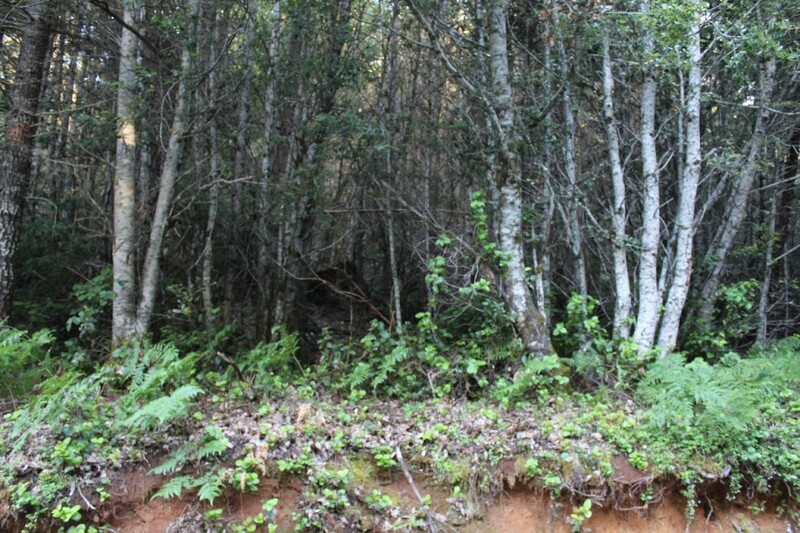 The front of the impression appears to show toes, although the one in the middle is the most prominent, which would be unusual, even for a sasquatch. Now, what is not clear in the image is that this track is in a snow surface that rises from left to right. it is also the only track of its kind in the immediate vicinity. There are tracks in front and behind this one which are much more human-sized, at least if you assume the humans are wearing hiking boots. I am pretty sure this track was made by a person who, for whatever reason, was stepping slightly up onto the bank on the right, possibly found a slippery spot, and rotated his or her foot back and forth to regain stability, and in the process created this impression. My strongest support for this idea is simply that this track was found in the middle of what was obviously a hiker’s trackway. This one I can actually imagine being reported by a very enthusiastic, if not completely careful person. An honest mistake is possible here. The point of all this is simply to demonstrate how easy it is for an enthusiastic, well-intentioned investigator to mistakenly (or intentionally) present evidence that isn’t. The first time I was in the Six Rivers National Forest in Northern California, I was immediately struck by the way sunlight can play around in the trees, and give a sense of motion almost anywhere. If someone had sasquatches (or any other animal, for that matter) on the brain, there would be ample opportunity to see all kinds of things that aren’t actually there. I am reminded of a conversation I once had in NorCal with a seasoned bigfoot investigator, who told me that he had lived in the area for more than a decade, and had never found any credible evidence of sasquatches. On the other hand, he regularly hears stories about people who, on their first night camping in the area, hear all kinds of strange vocalizations and rustling in the bushes just on the periphery of their campsites. When morning comes, they often find vague but suspicious impressions in the nearby ground. Does this mean that sasquatches somehow have the ability to identify who is looking for them and make themselves extra stealthy and elusive, and conversely, relax a little and mess around with campers that they somehow know are newbies? Or could it be the newcomers aren’t quite familiar with what barred owl vocalizations sound like, or how often raccoons, coyotes, or even black bears might root around in the brush around a campsite? The deep dark woods at night can be a wonderful habitat for an active imagination. I am certainly not trying to make the case that all such reports are made up or mistakes, but I think it is crucial for responsible investigators to make every effort to try to identify such reports, and exclude them from our collective body of knowledge. We have plenty of ghost stories, tall tales and legends, and these can give us some idea of what to look for, but they are no substitute for actual, genuine data.